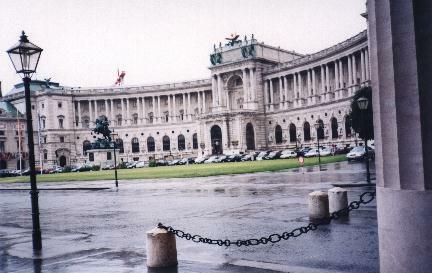 Part of the Hofburg Palace, called Neue Burg. It now houses part of the national library and some museums. Neue Burg was an addition to the Hofburg, built by the Hapsburg's from 1881-1913. It was a part of their struggle to hold together their empire through a show of power and wealth. Five years after Neue Burg was completed the empire ended. The domed building is the main entrance to the palace. 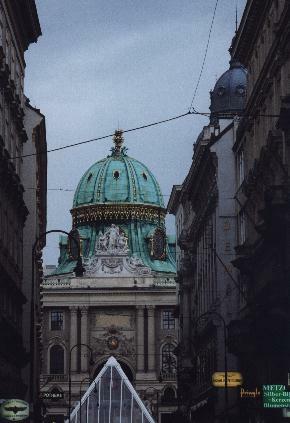 The entrance is Michaelertor, this part of the palace complex is called Michaelertrakt,and was constructed from 1889-1893. If you walked through the entrance under the dome, through a courtyard and out the other side of the building, you would end up in the "platz" in front of Neue Burg.